Soil erosion has a significant impact on the resident's safety and makes a great deterioration toward the environment. Generally, soil erosion is induced by several causes including rainwater runoff, agricultural activities, high hill slope, vegetation loss and wind incursion. It will lead to severe damages and endanger inhabitants’lives. Erosion control could be triggered in different kinds of areas and situations, so to protect soil surface and retain water-flow simultaneously is highly effective to deal with soil erosion issue. Excessive flowing water is a tough problem which makes surface eroded and lessens vegetation of slopes. Under the arising threat of global climate change which causes extreme weather to happen, more serious disasters resulted from record-breaking heavy rainfall have occurred. Therefore, effective solutions are needed more than ever. Turf reinforcement mats are one of the best selections for these issues because they are capable to provide long-term protection and permanent support for vegetation on slopes. With the aid of ACEMat™ R turf reinforcement mats, slope erosion can be well controlled and vegetation can maintain its function. 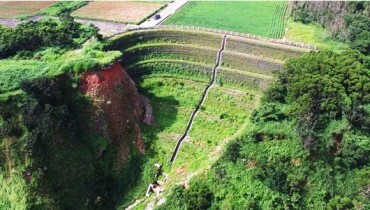 Here is a real case in Taiwan using ACEMat™ R for treatment and erosion protection. A layer of heavily weathered, loose sandstone blanks the entrance of Tunnel No. 9 along the scenic bicycle path located in Fengyuan, Taichung. 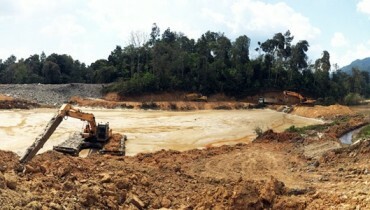 Freed fragments of the unstable rock surface would tumble downhill especially under torrential rainfall conditions thus, after the Central Geological Survey organization conducted environmental geological studies the area was classified as a debris sliding zone. The precipitate of the powerful Tropical Storm Bilis pounded the hillside slopes in 2006. In addition to eroding the ground surface, the excess moisture disturbed the arrangement of the sandstone and triggered a shallow plane failure which resulted in the surface sliding off of the bedrock beneath it. 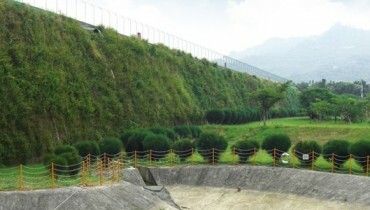 For the safety of passengers at the tunnel portal, resurfacing and rehabilitation of the hill face was required. Slope failure of this scale favors surficial repair with grouted rock nails and the added stimulation of vegetation growth. To successfully cultivate shrubs and other greenery, the 3D flexible erosion control ACEMat™ R, high tensile strength turf reinforcement mat (TRM) was combined with the rock nails and a steel wire mesh. After the compound system was bolted to the ground, a blended slurry of seeds, fertilizer and mulch was sprayed onto the rock cover. The hydroseed blend effortlessly lodged in between the cellular structure of the ACEMat™ R and various seedlings began to sprout. Slope rehabilitation and protection that integrates ACEMat™ R high performance TRM creates an unbeatable system for erosion control and the encouragement of plant life growth. Despite the regular occurrence of catastrophic typhoons and tropical storms, the revitalization of the tunnel inlet not only amplifies the scenic beauty of the bicycle trail but presents a flourishing, stable and pleasant habitat for local species. For more information of the case, please read the case studies. For details about the analysis and design of the project, please contact us.